so you can sort out your banking and reconciliations quickly. 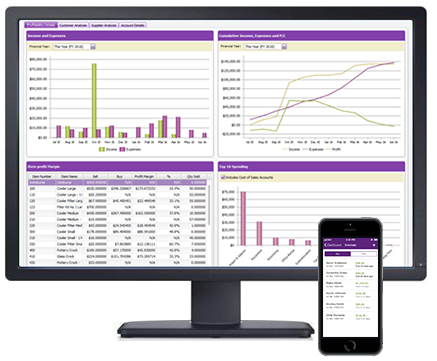 MYOB banks feeds are included with an AccountRight subscription and MYOB support many financial institutions in Australia and New Zealand, including banks, credit unions, and building societies. Apply—Start the application process in AccountRight and choose your financial institution and the bank or credit card you want to set up the bank feed for. Some banks allow the application to be completed via internet banking, otherwise you’ll need to submit an application form as described below. Link—Finish the process by choosing the AccountRight account you want to link the bank feed to. If you use internet banking with the financial institutions listed below, you can apply online. Otherwise, you need to fill in a form and allow up to ten business days for your bank to process your request. Go to the Banking command centre and click Bank Feeds. If this is your first bank feed, the Manage Bank Accounts window appears. Click Get Started with Bank Feeds. If you are already working with bank feeds, the Bank Feeds window appears. Click Manage Bank Accounts. When the Manage Bank Accounts window appears, click Add or remove a bank account. An internet browser window opens and the my.MYOB Sign In page appears. Sign in with your my.MYOB login details. Select a Bank eg Commonwealth Bank of Australia (CBA) from the list of financial institutions. Choose the option to continue the bank feed application online. Enter your account details and select the I confirm… checkbox. Click Submit. You’ll be provided an 8-digit code and directed to log in to Netbank. 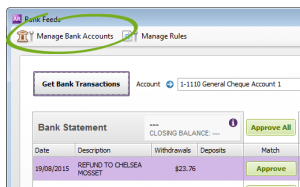 Click Manage my accounts then click Set up a transaction feed to MYOB. Enter your 8-digit code in the MYOB business reference number field then select the account you want to receive bank feeds for. To complete setting up a bank feed, you need to link it to the corresponding account in AccountRight. MYOB Australia will notify you by email when your bank feed is ready, and you can also check the status by clicking Check/update status in the Manage Bank Accounts window. This may take a couple of weeks. When your bank feed is ready, you’ll be able to download and approve transactions into your company file. Note that the first bank feed you receive will have transactions dated from when your bank feed was approved. Any transactions that occurred while you were waiting for the bank feed to be set up won’t be included. If you want to import and reconcile transactions dated before your feed approval date, you can use the Get Statement feature. This section explains the bank feeds management tasks you may need to perform after you’ve set up a bank feed, or when you no longer want to receive a bank feed. Go to the Setup menu then Manage Bank Accounts. The Manage Bank Accounts window appears. Click Add or remove a bank account. An internet browser window opens and the my.MYOB Log In page appears showing your accounts status.